Charminar: Built in 1591 by Muhammed Quli Qutub Shah as a talisman to stop a deadly epidemic, the Charminar offers a panoramic view of the city from its four (char) minarets that are about 49 m high. This mascot of the city was built, in an Arabic style of architecture, with lime and mortar. Within the Charminar is a mosque. A temple is at the base of one of its minars. Entry Fee: VIP Class Rs. 100 (Adult) Rs.75 (Child) Non Executive: Rs.50 (Adult) Rs.30 (Child) Child is reckoned as 3 to 10 years. Pochampally: Pristine environment, rustic beauty and wonderful weaves, thats Bhoodan Pochampalli for you. A centre of excellence for Ikkat (the art of 'tie and dye' in fabrics), which will cast its spell on you, this serene village is a wonderful getaway from urban lifestyles. Easily accessible and only 45 km from Hyderabad, it has many temples, a lake offering boat rides, 101 Darwaja House, Chenetra Gurukulam, Swami Ramananda Thirtha Rural Instititute and most importantly the Vinobha Mandir. Visit to relish the rural delicacies, also avail great bargains on sarees, fabrics, furnishings and handicrafts. 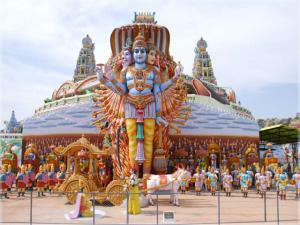 Surendrapuri: Surendrapuri is a theme park located about 60km from Hyderabad, India.The theme park is also known as Mythological Awareness Center. As the name indicates, it was established to create an awareness of Indian mythology, or more specifically Hindu mythology. It was established by Kunda Satyanarayana in memory of his son Surendra. It is also known locally as Kunda Satyanarayana Kala Dhamam, in his honor. Meaning that Kunda Satyanarayana has used artistry extensively to depict mythology. It contains nearly full sized replicas of almost all the important Hindu temples in India. The architecture of the temple and the sculptures inside make one feel as if one is in the actual holy place itself. There are a few hundred such replicas. There are sculptures and paintings depicting stories from major Hindu epics, Ramayan and Mahabharat. Scenes of war between Rama and Ravana in Ramayana and between the Kauravas and Pandavas in Mahabharat, are dealt with in great detail. For the religious minded, it provides satisfaction of having visited all the Hindu holy places in India in one short trip of about 3-4 hours. For the curious minded, it provides a good visual background of what Hindu mythology is all about. One does not have to be religious to visit this place. Mecca Masjid: Mecca Masjid owes its name to the presence of the bricks in the structure, which were brought from the holy city of Mecca. The second largest mosque in the country, it has within its periphery the graves of the families of Asaf Jahi kings. The stately architecture consists of single slab granite columns and five arches each on three sides. Construction started under the Qutub Shahi kings but was completed by Aurangazeeb in 1694. Qutub Shahi Tombs: Nowhere in history has an entire dynasty of rulers, been buried at a single site other than the Qutub Shahi Tombs. Just a km away from the Golconda Fort, the tombs were designed and commissioned by the Qutub Shahi rulers themselves. Built in an Indo-Persian style, the structures have a square base with domes that have pointed arches. The Nizam's Museum: A collection of the memorabilia, mementos and gifts presented to the last Nizam on the occasion of the Silver Jubilee Celebration are housed in the Nizam's Museum. It's located in the Purani Haveli, a 250 years old palace. The collection consists of the gold burnished throne used during the Silver Jubilee in 1937, gold model of the Jubilee Pavilion, a golden Tiffin box studded with precious stones and an excellent filigree of a mahout atop an elephant. Also on display are silver models of all the prominent buildings and 3 vintage cars, a 1930 Rolls Royce, a Packard, a Mark V Jaguar and various other antiques. Salar Jung Museum: The envy of global collectors, a treasure house of antiques and an amazing display of art - the Salar Jung Museum is the largest single man collection in the world. Compiled by Mir Yousuf Ali Khan, the collection is mind boggling not only in number but also in the variety of items. Some of the unique items are, the Veiled Rebecca, Marguerite& Mephistopheles (a two sided sculpture), the Sword of Aurangazeeb, gem studded daggers of Emperors Jahangir & Shah Jahan and Queen Noor Jahan, etc. Andhra Pradesh State Museum: Predominantly consisting of a collection of Heritage and Historic significance, this museum contains a Buddhist gallery, Brahminical & Jain gallery, Ajanta gallery, Arms & Armoury gallery, Numismatics gallery, antiques, art objects, etc. This museum is adjacent to the Contemporary Art Museum, both are located in the Public Gardens. Public Gardens: Locally known as the Bagh-E-Aam, the Public Gardens is located in the heart of Hyderabad. This popular park contains the State Legislative Assembly, Telugu Lalitha Kala Thoranam, Telugu University, Andhra Pradesh State Museum, Contemporary Art Museum, etc. Legislative Assembly: Sparkling white, with a combination of Rajasthani and Persian architectural designs, the Legislative Assembly complex, is located beside the emerald green lawns of the Public Gardens. Originally known as the Hyderabad State Town Hall and built in 1913, the only addition has been the imposing bronze statue of Mahatma Gandhi. Birla Planetarium / Birla Science Museum: Perched atop the Naubat Pahad, overlooking the Legislative Assembly, the Birla Planetarium is a favourite amongst lovers of astronomy. Equipped with advanced Japanese technology, the planetarium is the most modern and first of its kind in India. Adjoining the planetarium is the Science Museum, which showcases India's growing science and technological advancements. Birla Mandir: Referred to as the mini Tirumala, the Birla Mandir is a pure white marble temple, dedicated to Lord Venkateshwara. Built on the Kala Pahad, overlooking the Hussainsagar Lake and visible from miles around, the temple seems to be a projection of heaven. Hyderabad Botanical Garden: The botany enthusiasts have something to boast about with Andhra Pradesh's first Botanical Gardens. Spread across 120 acres, this park will have large water bodies, sprawling meadows, green grasslands, dense forests and exciting rock formations. Envisioned to have 19 sectors, the first phase of 5 sectors is already open to the public, providing visitors an awe inspiring experience. Lumbini Park: A place for entertainment, the Lumbini Park is a kid's haven, and is located on the bank of the Hussainsagar Lake. The colourful Floral Clock and musically synchronized water fountain are spell-binding. The jetty here provides for various types of pleasure-boat riding. NTR Gardens: Set on 36 acres of lush landscapes this is a memorial (Samadhi) in honour of Late N.T Rama Rao, a dynamic personality and Andhra Pradesh's most charismatic Chief Minister. Being one of the most visited spots, with serene ambience and recreational facilities, NTR Gardens overlooks the Hussainsagar Lake. A monorail train regales visitors with glimpses of the Machan (tree house), Japanese Garden, Car Café, Souvenir shops, Fruit Restaurant and children playing area, that are a part of this park. Hussainsagar Lake: Set in-between the twin-cities, with one of the world's tallest monolithic statues of Buddha in the middle, the Hussainsagar is a picturesque man-made lake. Created by Hussain Shah Wali, during the reign of Ibrahim Quli Qutub Shah in 1562, the lake has facilities for speed boats, a huge 48 seated launch with starlit onboard dining and provision for private parties. Osmansagar Lake: Popularly known as Gandipet, the most sought after picnic-spot, Osmansagar Lake is a drinking water reservoir for Hyderabad. Created by a dam across the Isa, a tributary of the River Musi, the lake overlooks the heritage Sagar Mahal resort. Nehru Zoological Park: Home for around 3000 animals, birds and reptiles, the Nehru Zoological Park is spread across 300 acres of verdant greenery, with 250 species living in conditions resembling their natural habitat. The biggest zoo in India, also the first to create moats around enclosures, the park has a Lion Safari, Natural History Museum, a children's train, and APTDC maintained Haritha Restaurant. KBR National Park: With over 100 species of birds, 20 species of reptiles, and 15 species of butterflies, KBR National Park is one of the city’s largest parks. The area is a Southern tropical deciduous forest and representation of the endemic flora of the Hyderabad region. Mrugavani National Park (Chilkur): An urban refuge for small mammals such a Wild Boar, Jungle Cat and birds, containing the endemic flora of Hyderabad, the parks offers quietude and is just 25 km from Hyderabad. Mahavir Harina Vanasthali National Park: Sheltering 350 Blackbucks, 400 Cheetal, Wild Boar, small mammals, reptiles and over 50 species of birds, this park is a good location to spend a day off being only 15 km from Hyderabad. HITEC City: The modern technology hub of Hyderabad, a zone for IT/ITES MNCs, HITEC City is situated at Cyberabad. This area with its towering, spacious office spaces is the face of modern Hyderabad. Ramoji Film City: Welcome to the awe-inspiring world of celluloid fantasies that exposes you to different environments and sets used for film making. This is the world's largest integrated film studio complex and one of Asia's most popular tourism and recreation centers. Spread over 1666 acres, it has hotels, restaurants, and guest rooms to accommodate artistes, technicians and visitors. One can be a part of the well organized package tours that take you all over the premises. Chow Mohalla Palace: 'Chow' means 4 in Urdu, signifying the number of palaces that are designed in Mogul and European styles of architecture. Built between 1857-1869 in several phases by the Nizams, these palaces offer a glimpse of the royal lifestyles. Three of these palaces are single storeyed whilst the main palace is a double storeyed structure. Falaknuma Palace: Built in 1892 by the Paigah noble Nawab Vicar Ul Umra, this majestic structure was later purchased by the Nizam VI in 1897. Designed in the shape of a Scorpion with 2 stings by an Italian architect, it is located on a hill at a height of 2000 ft. Louis XIV style of decor, stained glass windows, ornate fountains and marble staircases adorn this magnificent palace. Showcased here are a collection of paintings, Jade artifacts, statues, rare manuscripts, books and antique furniture. Mir Alam Tank: Located within the Nehru Zoological Park, the Mir Alam Tank was once a source of drinking water to parts of the old city of Hyderabad. Now, the A.P Tourism Department operates boat rides that are a favourite to the visitors of the zoo. Durgam Cheruvu: Because of its hidden location amidst hills, Durgam Cheruvu is also called the 'Secret Lake'. Situated in the Jubilee Hills area, close to Shilparamam and HITEC City, this lake is a favourite spot for the youth of Hyderabad. If there is 'Something Fishy' it must be the name of the bar here. Ramakrishna Math, Hyderabad: The beautiful and serene temple of Sri Ramakrishna was consecrated during the early part of 1981. 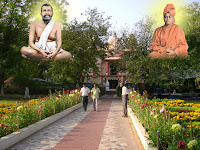 Every day puja and arati are preformed to Sri Ramakrishna Paramahamsa deva and bhajans are sung in the temple. And also there are four major festivals which are celebrated every year in the Math viz. Swami Vivekananda Jayanthim Bhagvan Sri Ramakrishna Jayanti, Sri Guru Purnima and Sri Sarada Devi Jayanti, besides other holy occasions like Ekadasi, Sri Sri Durga Puja, Sri Sri Kali Puja, Birthdays of Direct disciples of Sri Ramakrishna, Christmas, Buddha Jayanti etc. On the occasion of each major celebration there is a congregation of about 4000 devotees and 500 on the occasion of other celebrations. Daily around 200 devotees attend Arati on an average. The festival calenders are available in the Math office and are given on request. Finjaan: Finjaan is the first exclusive 'Tea house' of Hyderabad. The name Finjaan means 'a cup without a handle', but for its visitors, it's the cup of joy. Situated at Tolichowki, this unique beverage centre serves 36 different types of tea from across the world. Visit this tea house, for its sheer variety of flavours. Sudhakar Car Museum: Shoe car, Brinjal car, Burger car, Camera car, etc, can be found at this one-of-its-kind Car Museum located at Bahadurpura. With more than 80 models of cars and motorcycles, the museum is a must-see for automobile lovers. Cinema Ghar (M.F. Hussain's Museum) : This museum at Banjara Hills, was set up by M.F Hussain at Banjara Hills to restore the Yakshagan tradition. This institution is a tribute to the glory of Indian cinema and also houses some of Hussain's paintings. Also on display are a collection of books on subjects of art and films. A must-see for art lovers and film buffs. Paigah Tombs: A stunning fusion of Islamic & Rajputana styles of architecture with hints of Persian, Turkish and Greek art forms, these are the tombs of the several generations of the Paigah nobles. Located at Pisalbanda on the outskirts of the Hyderabad, these structures, spread over 30 acres, are unique specimens of extraordinary workmanship that is clearly visible in the wonderfully inlaid mosaic work and is compared to the Taj Mahal for the sheer splendour of artistry in white marble. Raymonds Tomb: General Michel Joachim Marie Raymond served as the Commander for the 19,000 strong Nizams army. Having come to Hyderabad in 1786 A.D, he was greatly admired for his gallantry. This tomb was built after his death in 1798, on a hillock at Saroonagar. Sanghi Temple: This beautiful temple is located in Sanghi Nagar, about 25 km from Hyderabad. The 15 feet Raja Gopuram can be seen from several kilometers away. This beautiful temple complex atop the hillock Paramanand Giri beckons the faithful devotees who seek God's infinite blessings. The aura of divinity and the verdant slope around the temple complex is panoramic and breathtaking. This temple has shines of several Hindu Gods, with Lord Venkateswara being the presiding deity, in the sanctum sanctorum at the centre of the complex. The idol is 9½ feet tall and resembles the deity at Tirumala. There is a special garden where all the exotic flowers, for daily rituals of the Gods, are grown. IMAX: South India's first family entertainment destination, PRASAD is home to the world's largest movie screen - IMAX. With a range of entertainment options present here, the place is a must visit for every fun lover. Located close to several gardens and the beautiful Hussain Sagar Lake, PRASADS with its five mini theatres, a giant screen, food courts, retail outlets and a gaming zone will keep you engaged for hours together. Ways to enjoy are so many that you will certainly make a second trip here if not more. Hayath Bakshi Begum Mosque: This mosque was built in honour of Hatath Bakshi Begum after her death in 1666. She was the daughter of the 5th Qutub Shahi king and the wife of the 6th Qutub Sahahi ruler. This mosque at Hayathnagar with 5 double arches and 2 majestic minarets had scores of rooms for travellers to rest. It also housed the 'Haathi Bowli' (Elephant Well) where water was drawn by elephants. City College: Located near the Muslim Jung Bridge across River Musi, this college was built by the Nizam VII in 1929. With more than 100 rooms and several spacious verandas, this 2 storeyed structure has identical facades on both the Eastern and Western sides. The 'Greater Hall' here can accommodate 1000 people. Asman Ghar Palace: Built in 1885 by the Paigah noble Sir Asman Jah, this palace derived its name Asman (sky) Ghar home, because of it being located at a height on a hillock. This castle like structure with granite turrets and arched windows has been designed in the Gothic style of architecture, and at present houses an archaeological museum. Chilkur Balaji Temple: Located in Chilukur, about 33 kms from Mehdipatnam, Hyderabad this temple is dedicated to Lord Venkateswara. Also known as 'Visa' Balaji due to the popular belief that He grants a visa to those who wish to go to the USA. This famous temple is the only shrine in India, that does not allow or accept cash donations from the devotees. thats a very exhaustive list of things to do and explore in Hyderabad. I have heard that hyderabad is also know for it handicrafts..any idea? can you pls suggest some good veg restaurants in hyderabad that serves hydrabadi food..